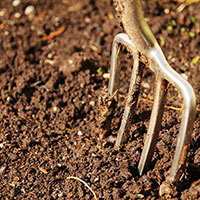 Preparing the soil for vegetables is an important element to starting a garden. Some people might say that the quality of the soil really isn't that important because we can replicate the growing conditions that any plant needs using chemicals and minerals. This is true to an extent, however what if you are someone who doesn't want to use chemicals? Here is what you can do. The ideal growing soil for most vegetables would be a crumbly loam because it is very easy to work with and it has great aeration and moisture retention. This ideal loam is rarely found to occur naturally, but it only takes a little bit of work preparing soil for vegetable gardens so that you can be off to a great start! Most soils are loosely classified into 5 broad categories, sand, sandy loam, loam, clay loam, and clay. Since you might encounter any one of these types, we'll discuss them all in the context of preparing soil for vegetable gardens. Clay: Generally you will only find pure clay deeper in the ground, but you can encounter various degrees of density in the top soil. What you are ideally looking for is the proper balance of clay, sand, and organic matter. Soil that has too much clay in it will actually will actually hinder the growth of your vegetables because it forms a barrier between the roots and the nutrients they desperately need. 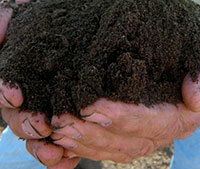 One way you can determine the clay content of your soil is to take a handful, wet it, and knead it into a ball. Then start rolling the ball between your hands until it gets thinner and thinner. If you can roll the ball out to the thickness of a pencil without it crumbling, then chances are you have a high clay content. Amending Clay Soil: Start off by mixing small amounts of both coarse and fine sands into the clay soil, along with organic matter such as weeds, grass cutting, etc, as this will usually give you the desired balance. Sawdust can prove beneficial in breaking down the clays in the soil, however sawdust also takes nitrogen away from the soil, which is vital to plant growth. You will probably need to add a nitrogen amendment to the soil if you use too much sawdust. Lime can also be used to break down the clay, but pay close attention to the acidity level of the soil as the lime will alter it. Most nurseries or garden centers sell test kits that you can use to check the acidity level of your soil, as well as the amendments to correct an imbalance if needed. When preparing soil for vegetable gardens, you will need to get the acidity level correct. Clay Loam: This type of soil has a much higher content of sands and organic matter and you will find it retains moisture and nutrients rather well, however you might notice that after heavy waterings the soil will compact and turn hard when it dries. Amending Clay Loam Soil: Clay loam will generally already have a fair amount of sands in it, so the most common remedy for this soil type is just to add more organic matter. As with clay soil, you can also use sawdust and lime as amendments, provided that you correct any imbalances they create, as mentioned above. Loam: As stated in the opening, this is the ideal growing conditions you could hope for, with the right balance of sands, clay, and organic matter. However as we also said, finding this type of soil is very rare. Typically the only thing you would add is a nice layer of organic compost to add nutrients to the soil. 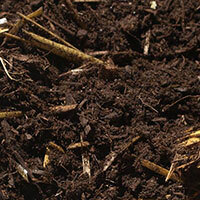 Sand: Sand is one of the toughest in preparing soil for vegetable gardens. Sand has very poor water retention as most of the water is drained very quickly down to the subsoil, taking all the much need nutrients with it. Now that said there are ways to grow successful vegetable gardens in sandy soil. Generally they involve a generous layer of mulch to help retain water and prevent the sand from scorching the plants on a hot day. You will also have to pay extra attention to nutrients, making sure to use fertilizers so the plants have a constant supply. 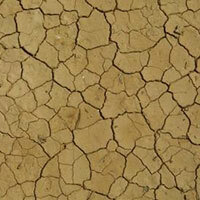 Amending Sandy Soil: One of the easiest ways to rectify sandy soil is to add clay loam soil to it. If that is not an option, you will have to add large amounts of organic matter such as straw, grass clippings, compost, mulch, etc. Sandy Loam: Very similar to clay loam except the balance is shifted to a higher sand content instead of clay. This type of soil you will find remains very easy to work with even when wet, and is extremely crumbly and drains quickly. Amending Sandy Loam Soil: This type of soil is fairly easy to correct the imbalance, you need only add amounts of humus or other organic matter into the soil until it becomes the correct consistency. As with sandy soil, you will also want to always add a generous layer of mulch on top of the soil to retain moisture and protect the plants. Solarization: One other factor when preparing soil for vegetable gardens is weeds and grasses. You can till the soil, but you will still have seeds and microbes in the soil. One way to remove these is to sterilize the soil through a process known as solarization. Once you have tilled the soil in the area you will be growing in, cover the entire area with black plastic, preferably a single piece if possible, and make sure to hold down the edges with old lumber of stones. This is to be done in the springtime as soon as weather permits. The sun will heat the ground under the plastic to well over lethal levels for any grass, weeds, or bacteria to survive. After a few short weeks you can remove the plastic, till in some organic matter, and you are ready to start planting. 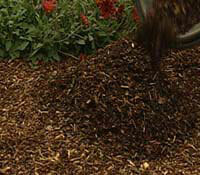 This is one of the easiest ways of preparing soil for gardens.